This article has been republished from Youth Ki Awaaz. Let’s begin with the obvious. Once each month, almost every woman gets her period. She doesn’t get a say in this. She doesn’t actively look forward to it. Yet, it happens. It’s a process as natural as sleeping, eating and drinking. It’s necessary too: there’s no life without it. Yet, most of us are hesitant in even talking about it and keep brushing it under the carpet. In India, when girls start menstruating, they don’t just begin a journey of silence and dread. They embark on a battle – a battle against the stigma associated with bleeding. Then, there’s the pain. Periods hurt. They cause backaches and cramps. Periods can be a terrible hassle. If you are a woman living in rural India, or for that matter, on Indian streets, things get way worse. Then having your period isn’t just a hassle; it’s a bloody nightmare – literally! Taboos, poverty, a lack of sanitary facilities and zero health education create an environment in which girls and women are denied what should be a basic right: access to affordable menstrual materials and accessible, clean private spaces to care for themselves. The facts speak for themselves. In rural India, one in five girls drops out of school, after they start menstruating, according to a research by Nielsen and Plan India. 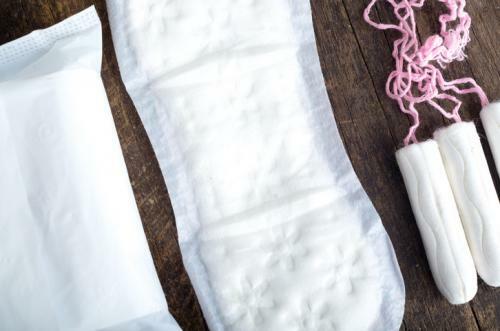 Of the 355 million menstruating girls and women in the country, just 12% use sanitary napkins, according to the findings of the study, “Sanitary Protection: Every Woman’s Health Right”, undertaken by AC Nielsen in 2011. Yet, instead of being counted as ‘necessities’, sanitary napkins are counted as ‘luxury products’ in India. With the introduction of GST, there is even a proposal to levy a 12% to 15% tax on them! Currently, sanitary pads are taxed between 12% to 14%, with the tax varying between the states. This would be funny, if it wasn’t so infuriating. It was the unfairness of it all that impelled Sushmita Dev, an MP from Assam to start an online petition on Change.org demanding government make sanitary pads tax-free. “Women are being taxed 12 months a year, for about 39 years on a process they have no control over.With the GST that is going to be implemented, a step needs be taken by the central government to make sanitary napkins tax free (like condoms and contraceptives) as it is an essential item which is a necessity for every woman,” her petition, that has since garnered nearly 3,00,000 signatures, reads. In a country where women are forced to use things like straw and ash during their periods, putting a tax on sanitary pads seems like a travesty of common sense. It’s basically taxing women for being women. After all, as Dev rightly questions, if condoms and contraception are tax-free to promote their use for health reasons, why on earth should sanitary napkins be any different? It also unfairly adds to the economic burden of women, who as we all know, get paid less than men in comparable positions. The gender pay gap in India is as high as 67% – a man on an average earns $167 compared to the $100 earned by a woman, according to a report by Accenture Research. The need to get rid of this tax, however, goes beyond a financial value. The more problematic bit? It basically suggests that it’s okay to overlook the basic necessities of women. It is nothing short of legitimising misogynist discourse and period shame, by saying that the very basic needs of half the population of this country don’t matter. Periods are no luxury. You can ‘opt into’ extravagance. You cannot ‘choose’ to menstruate. It’s imperative that this crucial difference is understood. Taxing women for a biological process they have no control over is like taxing women for who they are. It is unfair and adds a whole heap of disadvantages for most women on top of those that already exist – and more so in a country like India, where access to affordable menstrual products for all still remains a distant pipe-dream. It’s a sword that cuts women on all sides.